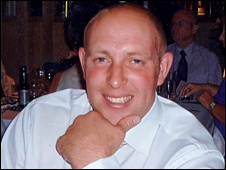 Purdham was described as "a gentleman and a pleasure to know"
Tributes have been paid to former Workington forward Garry Purdham, 31, who was one of 12 people shot dead by Derrick Bird in Cumbria on Wednesday. Purdham's brother Rob has been granted compassionate leave by Super League side Harlequins, where he is captain. A statement from chairman Dave Bowden on Workington's website said everyone at the Championship One club was "shocked and devastated" by the news. "Garry was quite simply a gentleman and a real pleasure to know," said Bowden. "He was as honest and industrious on the pitch as he was off it. He would think nothing of doing a stint on the farm before turning up to play. "He was a local lad who had a wonderful, calm and mature temperament coupled with a dry sense of humour and as a result was one of those players that his team mates looked up to. "He had the respect of the whole rugby league community in West Cumbria, and will be missed by all involved in it. "Our thoughts are very much with all Garry's family at this very sad time." Bowden added that the club would look to set up a memorial for their former player. "I am sure when things settle down, we will think of something appropriate to remember him by," he said. "Very little has been said so far because everyone is so shocked. "One player said to me 'it's strange seeing your team-mate's name across the bottom of a TV screen'. I don't think it's sunk in just yet." Purdham returned to full-time farming in 2008 but recently returned to action for his old amateur club Egremont Rangers. The Rugby Football League's chief executive Nigel Wood said: "We are extremely shocked and saddened to hear of the tragic events which occurred yesterday in Whitehaven and surrounding areas. "Clearly a great number of Rugby League people will be personally affected by these truly awful circumstances. "The thoughts of everyone at the RFL and within the Rugby League family are with the Purdham family and with the local West Cumbrian community at this difficult time." The Purdham brothers played together at Whitehaven after turning professional in 1999, before Rob joined Harlequins - then known as London Broncos - in 2002. England international Rob Purdham has travelled back to Cumbria to be with his family and is not expected to play for Quins in Sunday's home Super League game against Crusaders. Meanwhile, Harlequins have sent their "deepest sympathy and condolences". Chairman David Hughes said: "The thoughts of everyone at the club are with the Purdham family at this terrible time, and all those affected by yesterday's tragic events in Cumbria." Hull coach Richard Agar added his voice to the tributes paid to Purdham. "I played against Garry Purdham many times and it defies belief," said Agar. "Garry was a real tough character and a real honest guy and it's quite incredible and sad that he's obviously been in the wrong place at the wrong time. "I think rugby league's thoughts are all with Rob and the Purdham family at this time." Bird, 52, went on a three-hour shooting spree before turning the gun on himself.